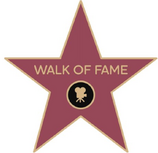 Click here to go to our Hollywood Walk of Fame Spring Show page! Happy Grams are placed in the program at the discretion of the show director/program production team and cost $5 each. Fill out the form below or find a paper form at one of our ticket sales tables during Learn to Skate. All Happy Gram submissions must be in by 11:59 pm on March 24th, 2019.
a - Sk8 Great (skater name here)! b - We love you (skater name here)!! c - Have fun (skater name here)!! d - Congrats ( skater name here)! e - Way to go (skater name here)!! If you would like us to put something after the message like "Love Mom & Dad", give us that information here. It can only be a few words - not a book! The Florida Everblades Figure Skating Club, along with Hertz Arena’s Learn-to-Skate USA program, is proud to announce the date for its annual Spring Show is March 31st 2019, at Hertz Arena in Estero, FL. This year’s theme is “Hollywood Walk of Fame” and will feature music from all of your Hollywood favorites. We will have club skaters, as well as learn-to-skate groups of skaters, performing spins, jumps, and other figure skating moves. This is always a highly attended event and we would like to invite you to submit an advertisement to be printed in the program, which will be handed out at the door to all ticketholders. The program format is 5 1/2" X 8 1/2", or "booklet size." We ask that advertisers submit camera-ready artwork, but if you need an ad made, please send what you have and we will be as creative as possible for a $25 set up fee. The advertising deadline is March 24th, 2019. Ads received after that date will be included to the best of our ability if time and layout permit. Your support of the 2019 Annual Spring Show and the Florida Everblades Figure Skating Club is greatly appreciated. Programs will be given to each ticket holder as they come in the door and made available for coaches and participants to pick up as souvenirs afterwards. Thank you for your participation. Please click here to download and print a form to mail or hand in (email fefsc@fefsc.org to make arrangements) OR fill out the form below and pay via the paypal link below that. Thank you! Business card included with checkCamera ready copy of ad included with checkElectronic copy of ad/business card emailed to fefsc@fefsc.org and/or attached to this form.Please set up my advertisement with information enclosed and/or personalize it with the information supplied for an additional fee of $25. If you are purchasing more than one program ad, you may take 20% off of your total bill. Please remember to click the submit button below before moving on to the paypal button. Because there are so many different possible combinations, we are not making a paypal button for each - we are making a generic button in which YOU put in the total. If you have questions, or would rather we send you a paypal invoice, please contact us at fefsc@fefsc.org. Thank you! The button below will take you to our PayPal account; please enter your total amount due there.